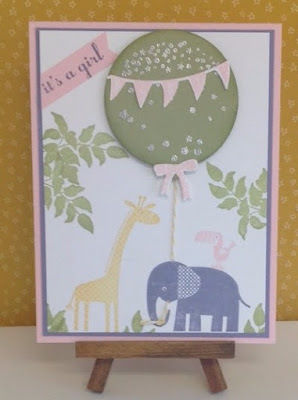 Margie's Crafts: Zoo babies by Stampin' Up! Zoo babies by Stampin' Up! I don't know about you but I know a LOT of people that are pregnant right now. I usually don't have too many baby showers to go to on a regular basis, but now my daughter's friends are starting to get married and have babies. I needed a card for a baby shower that I am going to next week and I knew the PERFECT stamp set to use! I love Zoo Babies and knew that was the set I was going to use. Stamp set found on page 32 of the annual catalog. Stamp images from Zoo Babies, elephant in Wisteria Wonder, giraffe in So Saffron, bird in Pink Pirouette, leaving some space between to stamp branches. Stamp the branch leaf image in Pear Pizzazz randomly at sides and bottom of card stock. Swipe the embossing Buddy on the piece of Pear Pizzazz card stock and stamp Balloon image with VersaMark ink pad. Emboss with Silver embossing powder, cut out using the Balloon Framelits. Stamp baby flag image and the bow with Pink Pirouette and cut out with coordinating Balloon Framelits. Stamp “its a girl” with Wisteria Wonder. Use banner punch to flag the end. Adhere to card stock at an angle. Trim excess. Using the 1/16” circle punch, punch a hole at the top of the elephant, then again at the chin and again at the beginning of the trunk and the bottom of the trunk. Adhere Dimensionals to the cutout Balloon and taking a length of the Crushed Curry twine, attach to the bottom of the balloon. Mount the balloon to the white card stock at top, leaving the twine hanging. Attach flag banner and bow to the Balloon with Mini Glue dots. Thread the twine down through the elephant behind his head and up through the bottom of head then down through the top of the trunk, bring it back to the top. Tie a knot, leaving piece to hang. 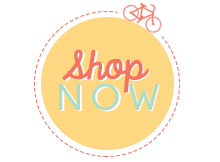 Put all card stock layers together with adhesive of your choice. This can easily be changed to a “boy” card by changing the colors.